As I’ve shared my own journey on this blog, I started featuring guests a few years ago. I believe in sharing a variety of ways people use the bullet journal system to live their lives, that perhaps you’ll be closer to some planner peace if you saw the possibilities. So thank you to these bujo friends for sharing their journals with us! Note: This post may contain affiliate links, which means if you happen to purchase anything I’ll make a small commission at no additional cost to you – thank you so much for your support! Clutter is the bane of creativity and expression. When I talk about clutter, it is not merely referring to that pile of paper on the document tray that you had meant to clear out last year or the stash of memorabilia that you hardly look at but feel wrong to throw away because they were from your first love whom you could barely recognize when you passed him on the street last night. I am also talking about that intangible mess of to-do’s, checklists, notes and reminders that you keep in your head. So many that you tend to miss or forget some which makes you feel awful. And you wished you had more time in a day or that you were not feeling this overwhelmed all the time. Do you feel tired even, reading that? For more than two years now, I have been free of that chaos and it is, oh, so liberating! They now live between the pages of my bullet journal and my book of collections in an orderly manner. I’ve gained so much useful capacity just by decluttering my mind. My bullet journal is like an extension of my brain. In it resides my daily and future to-do lists, deadlines, events and appointments. I have every single thing I want to do written down, no matter how small the task may seem, like a reminder to replenish the tissue in my purse. I jot down the moment a task comes up or strike out a task the moment it is completed. Do not deliberate on it too long. As with the KonMari method of living clutter-free which I swear by, decide on a home (or schedule, in our case) for the item on hand or dispose it. Putting off will only start a clutter. I use a single A5 dot-grid bullet journal for everything from personal to work and carry it with me always. When I am at my desk, I will have it open and ready within an arm’s reach. I keep a separate notebook for my lists and collections which are not time-bound. I find the flow better this way, not having to flip back and forth between pages of schedules and lists. I call this my book of collections. It is home to my travel checklist, Etsy ideas and many others. For this, I am currently using a ruled A5 notebook. My bullet journal is simple and minimalistic. I place a lot of emphasis on function over form, but still maintain an aesthetic that sparks joy in me. Yes, that is my KonMari side speaking. I cannot begin to stress how important it is that everything you do, let it be something that sparks joy in you. Or if it is something that you just must do no matter how you dislike it, do it with joy and gratitude instead of dread. I do not have elaborate setups or drawings for my spreads (though, I sometimes doodle on it). I find that my bujo works better for me when all my actionable items are clear and concise, and most importantly clutter-free, that’s where the magic of white spaces comes in. My monthly log is a one-pager where I have my monthly goals, a mini calendar, task list and events/appointments all on it. It is vital to me to have all these in one view to ease my planning. Every month, I set three small goals to achieve which are baby steps that help to keep me on the right track towards my long-term goals. My mini calendar is my most-used reference. You will see it recurring on every spread since I also have it on my weekly log. It gives me a good sense of time and helps me plan better. The to-do or task list and events/appointments on my monthly log is a place where I note down future items for the month which do not belong to the current weekly log. They will then be scheduled into their respective dates once we have reach the week. On my weekly log, I have my mini calendar with the week-in-progress highlighted. Again, clear sense of time is the idea here. As my day progresses, when tasks pop up, I will write them down either at their respective due dates or under the unscheduled task list which I will then assign a date for at the end of the day. My daily log is a comprehensive list of actionable items and appointments for the day. All big agendas will be broken down to smaller items. For example, instead of having a task called ‘Update Etsy shop’, I will have, say, three tasks consisting of ‘Upload new shop banner’, ‘Update shop info’ and ‘Reactivate expired listings’. As how the KonMari method goes, you pull out everything from every corner and leave nothing behind, so that whatever needs your attention is right in front of you and ready to be tackled. I used to have this problem with monthly bills. I kept forgetting whether or not I have paid this or that for the month and ended up having to dig through my bills to check. So I drew up a table of monthly dues where I track all my bills and mark it down the moment I make the payment. This has saved me from so much frustration. It is the only tracker that I find effective enough for me to use without fail. One of the most frequent questions I get is about my color dots and what they mean. Basically, it is my category system. Each of my tasks will fall into one of my five main categories: branding, Etsy, study, social media and personal. Each of these categories are assigned colors which I usually change every month. This enables me to tell from a quick glance where I spend most of my time and to work on balancing it out. A lot of my planning practices are based on the essence of the KonMari method of decluttering, as you may have seen me mentioning it here and there. I incorporate the method in most aspects of my daily life ever since I witness its miracle in clearing up a lifetime of junk from my house and turned my life around for the better. If you’re curious to know more about it, grab yourself a copy of Marie Kondo’s The Life-Changing Magic of Tidying Up. Just my honest recommendation, not an ad, but do note that the book is about decluttering tangible objects and in no way related to bujo. Sunday night is my planning night when I will get cosy with a cup of tea and start setting my for the week ahead. The first thing I do is to go through any open items from the current week and schedule them into the new week. Now comes the best part, my favorite part: writing down all the tasks and big ideas or plans I have for next week, purging them all out of my system onto paper. This is what keeps my mind clutter free so that I can solely focus on what I need to do or simply just get my creative juices flowing. My setups are usually the same from week to week and I tend to stick to something if it works for me. I do test out different tweaks sometimes to see if it works better. Use a system that helps you, do what makes you happy. 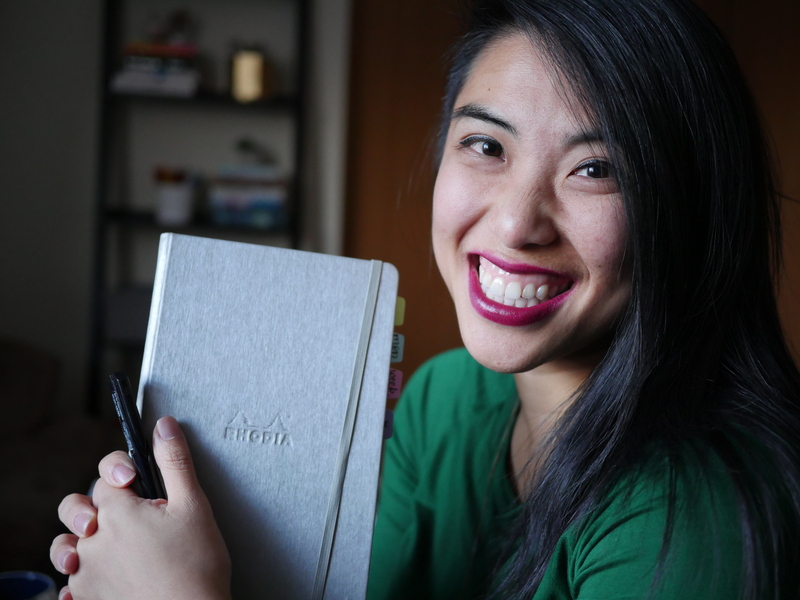 If you’re new to bujo, learn the basics and basis of a bullet journal from its originator, Ryder Carroll. Don’t be overwhelmed by what you see on Instagram or other social media. Don’t be pressured to fill your pages with doodles or drawings if that is not your thing. I just have to say this because I’ve come across so many people asking how they can bujo without learning to draw. At the end of the day, a bullet journal is supposed to be your trusty companion that will help you do more with less, not bog you down. Thank you for taking the time to describe your system. I am also a KonMari fan, but I think I need to reread the book!